Asparagus is only in season for a few short weeks, so I try to take full advantage of this classic spring vegetable. It’s not only delicious it’s also good for you too. It’s a good source of folate, fiber, heart-healthy potassium, and antioxidants. Plus, it’s low in calories. 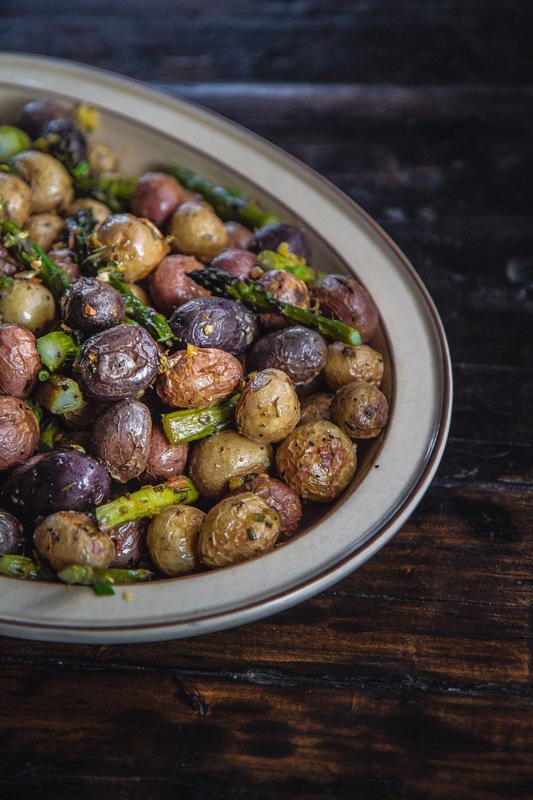 We love roasted potatoes and we love roasted asparagus, so it only made sense to put them together. 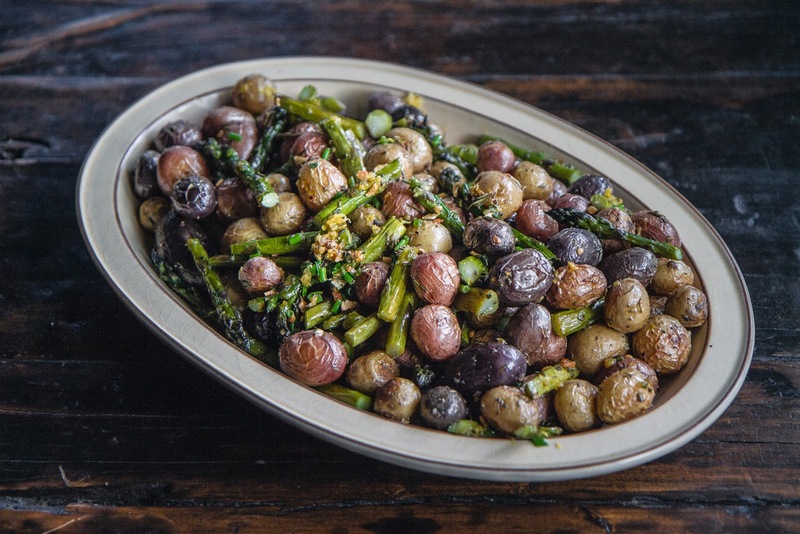 Roasting draws out the earthy flavor of the asparagus and the potatoes, so I thought the perfect match would be something to give it all a fresh burst of flavor. Some just-cut-from-the-garden herbs and lemon zest did the trick. The result is a comforting Spring side dish that’s pretty enough to serve at a dinner party or casual get-together. In a medium sized bowl toss together the potatoes, 2 tablespoons olive oil, rosemary, and garlic. Line a large rimmed baking sheet with foil. Transfer the potatoes to the baking sheet and place in oven for 20 minutes. In another medium sized bowl toss the asparagus and remaining two tablespoons olive oil. Remove the baking sheet from the oven and add the asparagus to the pan. Place back into the oven for 20 minutes. Transfer vegetables to a large serving platter. Sprinkle on salt, black pepper, lemon zest, and chives. Toss to coat. This is a terrific side to any roasted meat, poultry or seafood dish. The fancy potatoes combined with asparagus is the perfect compliment! I'll try to do it on a closed grill in the warm months in a cast iron cooker. Yes. LOVE the idea of doing on the grill.